Gen. Stanley McChrystal is considering rewarding battlefield restraint. Washington (CNN) -- U.S. and NATO troops in Afghanistan could someday be awarded medals for restraint that prevents civilian casualties in combat. The possibility is under consideration by the staff of Gen. Stanley McChrystal, the commander in Afghanistan, according to Lt. Col. Tadd Sholtis, McChrystal's spokesman. The idea of rewarding battlefield restraint was proposed by British Maj. Gen. Nick Carter, who is in charge of the international forces in southern Afghanistan. Sholtis said the idea is still in its "conceptual stage." "Although no decisions have been made on the award itself, the idea is consistent with our strategic approach," Sholtis said. "Our young men and women display remarkable courage every day, including situations where they refrain from using lethal force, even at risk to themselves, in order to prevent possible harm to civilians. In some situations our forces face in Afghanistan, that restraint is an act of discipline and courage not much different than those combat actions that merit awards for valor." Sholtis said troops would still have the right of self defense. "Let me be clear. We absolutely support the right of our forces to defend themselves. Valuing restraint in a potentially dangerous situation is not the same thing as denying troops the right to employ lethal force when they determine that it is necessary." 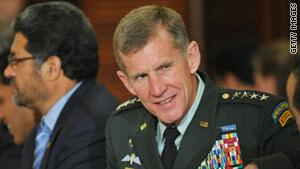 McChrystal has placed a priority on reducing civilian casualties as a means of gaining support of the Afghan people. A number of recent high-profile incidents in which civilians have been killed have given the Taliban a propaganda tool against the coalition, U.S. officials said. McChrystal has instituted other rules to help minimize civilian deaths, including restricting the use of airstrikes in areas where there may be civilians, and limiting nighttime raids by U.S. forces.